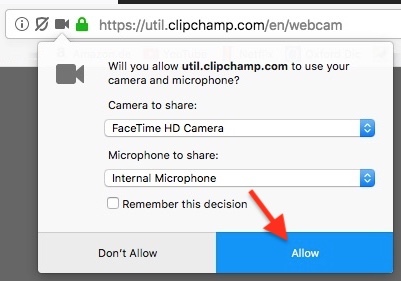 Clipchamp Utilities allows you to record videos in your browser with your device’s webcam, without any need to install software. In order to record a video, you need to allow Utilities to access to your webcam and microphone (otherwise your camera won't turn on and you won't be able to record). This works for your computer's built-in camera as well as for external cameras. NOTE: we don't have access to any recordings you make (they stay on your computer) and utilities only accesses your camera and microphone for the purpose of you using it. 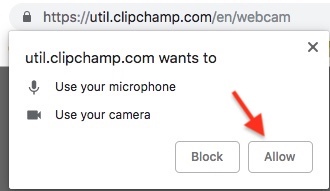 A prompt should pop up (usually in the top left of your screen) asking if you want to allow "util.clipchamp.com" to use your microphone and camera. Click Allow. 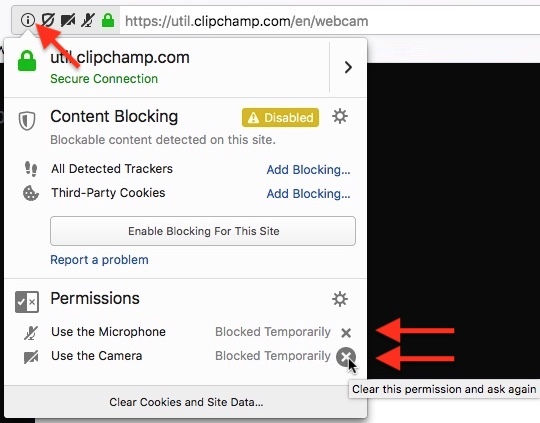 If you accidentally clicked Block, if you don't see the above prompt, or if you see a screen that says "Initializing webcam…" but never progresses to the recording, your browser may have blocked access to your webcam. Click on the lock icon to the left of your address bar, and select Allow for both Camera and Microphone and Reload the page. 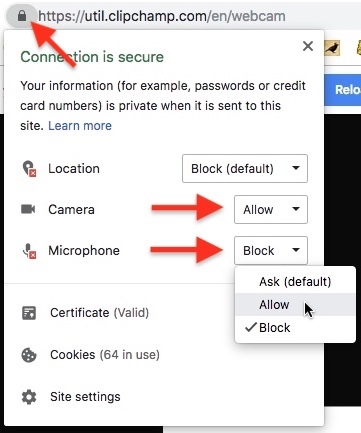 Click on the i icon to the left of your address bar, and under Permissions click the X next to 'blocked temporarily' for the Camera and Microphone. Then Reload the page and you will be asked again if you want to allow access. Click Allow. Once you've allowed access, you should be taken to the recording screen and can start recording your video. What if my webcam still doesn't turn on? 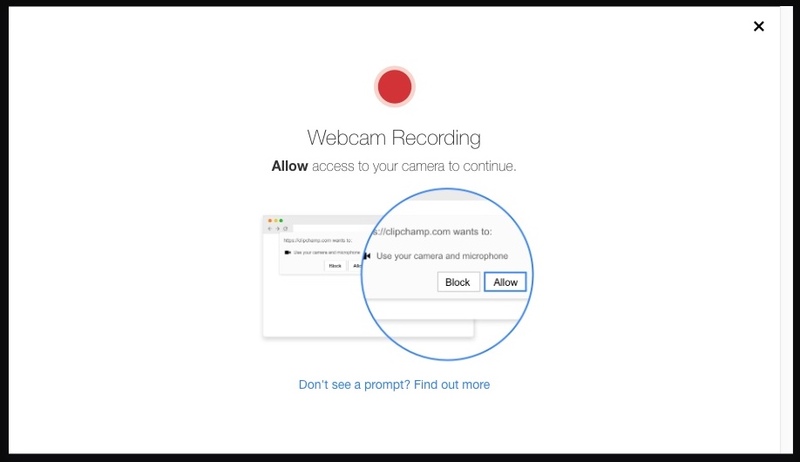 Alternatively, webcam access can also be blocked if you have another app or browser running in the background on your computer that is accessing the camera (e.g. 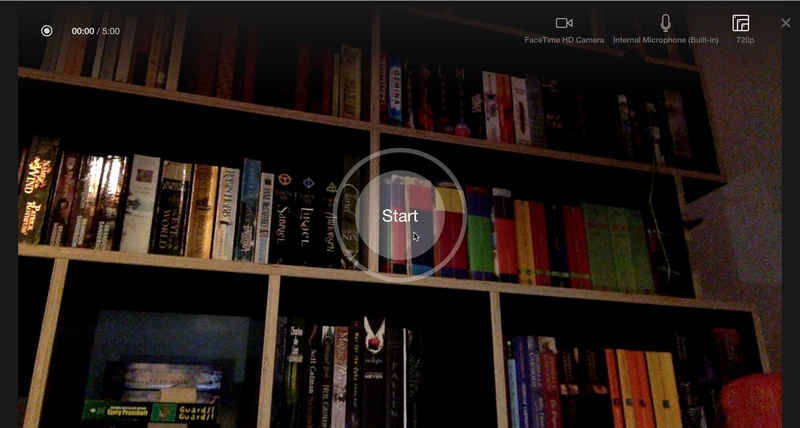 Skype, Photobooth or Clipchamp Utilities in another browser). Try closing down other apps that might be accessing the camera and reloading the page or restarting the browser. We've also heard from some users that Firefox (and Chrome) plugins and extensions such as Flashblock can prevent Clipchamp from accessing your webcam. 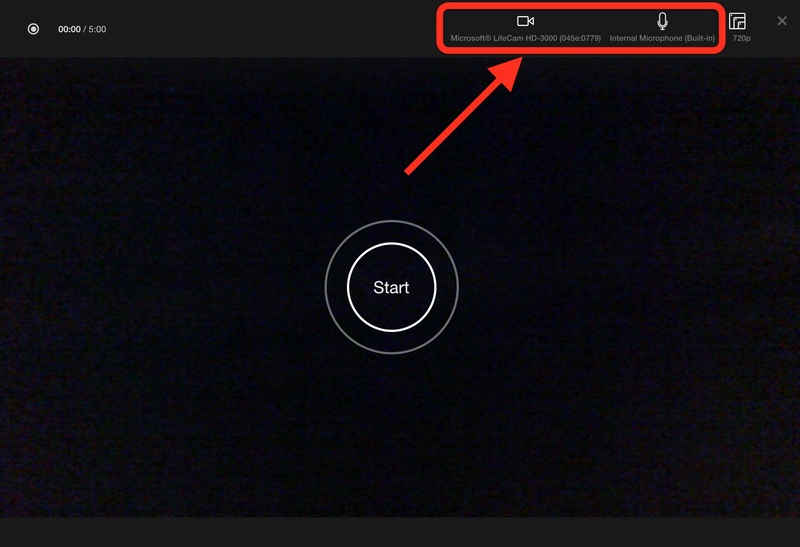 If you have such a plugin installed, disable it and see if the webcam access works afterwards. You can also try troubleshooting steps described in this article: What to do if Utilities doesn't work. If none of the above solve the issue, you can contact us by using the chat icon in the bottom right of this page. Note that at certain times of the day or on weekends it may take a while to receive a response due to time zone differences and our office hours.